Image: Courtesy of Breakthrough Entertainment/© 2015 Gables Productions Inc.
Like approximately half of the country, I woke up the morning after the election in the depths of despair — to borrow a phrase from Anne Shirley, the spirited orphan from L.M. Montgomery’s Anne of Green Gables book series. Everything seemed bleak and I was having trouble processing the results, so I popped in the DVD of the 1985 CBC movie version of the book and escaped to Prince Edward Island for a few hours. Post-election, from under my weighted blanket, I watched as Anne’s strong will and determination not only got her out of jams, but also served as the necessary catalyst for prompting change in Avonlea, including shifting attitudes about women’s participation in everything from further education to three-legged races. If there were ever a time for us to be more like Anne Shirley, it’s now. This fictional Canadian orphan is the hero America needs, and thanks to a new PBS adaptation of the book airing on Thanksgiving night, that’s exactly what we’re getting. Full disclosure: I have not yet seen this version of Anne of Green Gables, scheduled to air at 8/7c on PBS on Thanksgiving night, so I can’t speak for the quality or content of the new adaptation. But if it introduces a new generation to Anne Shirley, then it has done its job. It also stars Martin Sheen as the infinitely loveable Matthew Cuthbert, and it won’t hurt to have the calm, reassuring presence of President Bartlet back in our lives for a night. Since the publication of Anne of Green Gables in 1908, Anne’s simultaneously unique and relatable personality has appealed to readers all over the world. She wanted to be a writer, desperately wanted to be a good person (but also beautiful), stood up for herself and worked hard until she achieved her goals, which ranged from winning the Avery Scholarship to owning and wearing a dress with puffed sleeves. She was tenacious, fun, undeniably clever and wasn’t afraid to break a slate over a boy’s head if necessary. I have loved Anne Shirley for as long as I can remember. We videotaped the 1985 television adaptation starring Megan Follows, Colleen Dewhurst and Richard Farnsworth when it aired on PBS, and by the time I was old enough to start reading the book series, I already felt as though Anne, Diana, Marilla, Matthew, Gilbert — even meddling neighbor Rachel Lynde — were family. I saw so much of myself in Anne and wanted to be just like her, including having the same carrot-red hair that she loathed. When I was 12 and a friend of mine dyed her hair a deep shade of red using henna, I took this opportunity to ask if I could do the same in order to look more like my beloved Anne (“but mom, henna is natural!”). When my request was denied, the same friend told me that if I put peroxide on my dark brown hair and then sat under a desk lamp, it would have the same effect as henna. 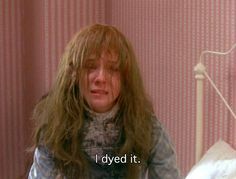 Turns out she was right, but instead of a beautiful crimson, it turned my hair orange. But not Anne’s rich ginger — orange-orange, or as my mother’s helpful hairdresser described it, “orange like a pumpkin.” Anne and I both failed trying to achieve each other’s hair color, but that was just something else that made me think we were kindred spirits. After all the uncertainty of the past few weeks — particularly surrounding someone else with orange hair — I’m looking forward to spending some time with Anne and other old friends from Prince Edward Island on Thursday night. Anne of Green Gables airs on PBS on Thursday, Nov. 24 at 8/7c and is 90 minutes long.